This fun ridge route mostly hiking, 3rd and 4th class climbing with a few 5th class pitches. Begin on the east side of the toe of the ridge. Most of the route stays just east of the ridge-crest. 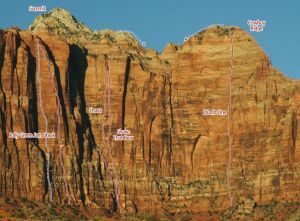 The crux is the second to last pitch, which consists of an exciting and exposed 5.7 hand crack. From the top of the ridge, there is still a bit of scrambling and tricky route finding to reach the true summit. 3300+ feet of elevation gain loss. Which SuperTopo guidebooks include a topo for Cowboy Ridge (AKA Southwest RIdge)?